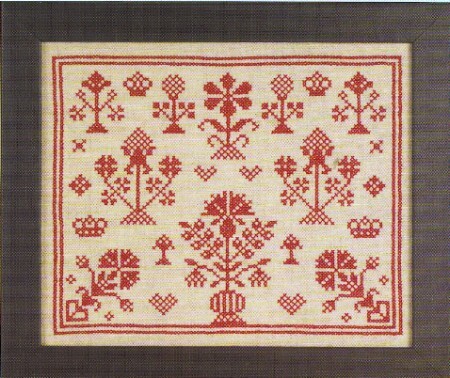 This cross stitch stamped sampler craft kit is an excellent way to practice your red stitches on this Quaker Sampler.Various Pennsylvania Quaker motifs are joined in this printed cross stitch sampler to teach a young girl to sew.This sampler with decorative motifs makes a wonderful cross stitch printed sampler reflecting those from the Quaker tradition. 460/Dark Navy Handwork compliments this sampler. Brick House 8" x 10"